I mean, nothing really seems worth playing or writing about or gaming when I could obsessively re-read the PAX schedule and re-plan and double check my packing list and see if there is anything I could pack five days early. But, Guild Wars 2 came out and most of the gamers I know were pretty excited for it. I received a copy myself as a wonderful gift, so although I wasn’t exactly waiting on the edge of my seat for it, I excitedly started playing it on Saturday just like all the other pre-order folks. First off, I should explain my experience with MMOs; it is next to nothing. I played the trial version of WoW, back in the day when it was a week, instead of the first twenty levels. I played some free-to-play MMO that I’ve forgotten the name of a little more recently than that, but I didn’t get far in it. So my standard by which to compare GW2 to is . . . lacking, to say the least. It took me way too long to recognize that was a 2. With that disclaimer, I will say the music is fantastic. I am in the Plains of Ashford as a female Charr warrior that . . . I tried to make as ruggedly scary looking as possible. Half a horn missing, one eye milky white, the other eye bright orange with no pupil . . . those are pretty scary features to me. Unfortunately the voice acting doesn’t fit with my grizzled war chieftess at ALL, but her fur is sienna with light grey stripes throughout, including on her face so . . . you win some, you lose some. Anyway, back to the music. Again, I’ve only been to the Plains of Ashford (and the Black Citadel) but the jams are very epic. Very appropriate to the setting as the scenery changes and really top quality. I guess since there is no monthly fee, even though I didn’t play the original Guild Wars, I was expecting a cheaper experience, but for me, springing for a great composer and a great recording orchestra truly immerses me in the environment, so good on ya, NCSoft! I am so very close to level ten, and then I stopped to pack for PAX, but in ten levels, I can say that I like the combat system very much. I love that skills change with weapons so I’m always seeing something new, and there are more variables to choosing your weapon (e.g. I started with a sword that was okay, then I got an axe which was awesome, and then I got a very powerful mace, but the mace skills are slower, so I went back to the axe even though it has less raw power points. Very cool, Guild Wars 2!). I haven’t felt like I”ve been grinding at all, although I do have to stop just exploring or just continuing on the main plot path every soft often because I’ll realize that I missed a few quests in one area which means I’m not at the recommended level for the next quest in the plot or the area I happen to be exploring. I don’t think that’s necessarily a bad thing, but it might be a con for people that really hate to have to cover every quest before doing what they want at a decent level. I’d also imagine that the higher level you are, the less this happens. Unfortunately, I am so very uninterested in the story. I’m curious to use one of my other five character slots (also a cool feature) to pick a different race and see how different every thing is. Or if it’s all generally the same but with different names and places. Anyway, there’s in-fighting and clans and betrayal and . . . blah. I’m not sure why it hasn’t really captured me, but it really hasn’t. The voice acting is pretty good but the cut scenes are a let down. I shouldn’t be expecting RPG cut scenes but I kind of was, so to just see two talking heads every time something happens removes me from the world I’m supposed to be plugged in to. Don’t compare to an RPG, don’t compare to an RPG, don’t compare to an RPG! I don’t think I can comment much on the art or graphics. Pretty standard MMO stuff. Can’t knock it for fitting the genre and trying to appeal to as many hardware setups as possible. Finally, the controls had quite the learning curve for me. I was really prepared for the click-to-move set up and doing whatever else you need with the keyboard and your left hand (assuming you’re right-handed, of course). In GW2, you use keys to move you around with one hand and combat skills with the other hand, but the mouse is sill what reorients your screen for you. Very odd. Maybe I’m just not getting it very well, in which case, can someone please explain it to me? Out of habit, I re-mapped the number pad on the right side of the keyboard to be my movement keys and I use the number row at the top of the keyboard with my left hand to perform all my combat skills, but I think I did it backwards. If I kept WASD then I could use my right hand for the number pad and combat skills while fighting and on the mouse to re-orient the screen while running around. I feel like when that thought occurred to me earlier there was a drawback, but now it’s not coming to mind . . . better change the keys when I play next, then maybe I won’t complain about the controls any more. Anyway, those are all my thoughts thus far. I die fairly frequently, and apparently I have a “hook up” with some good gear but I gotta message a certain someone first. I’ll get to it one of these days. I have no firm opinion about Guild Wars 2 yet because I just don’t care too much about it. Fun enough, I’ll keep playing until I find a concrete reason not to, but I haven’t fallen in love with it by any means. I dont’ know why, but looking at that screenshot of the two people talking, all I could think about was Chun Li and Balrog talking trash before the beginning of a fight in Street Fighter. Personally, I love the ringing endorsement at the end. Also, you’ve been picked for The Lovely Blog Award! Maybe accept this award? 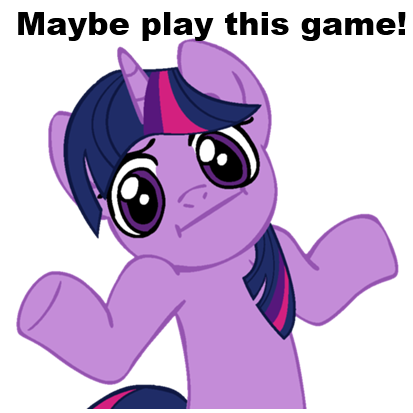 Ha, yeah, ponies convey emotion best. Thank you for the nomination! At a non-PAX place and time (i.e. Tuesday), I will officially accept with a blog post! You guys are great!